Its said that Okra has enough nutrition to increase your brain power. But potatoes made me tactical, I guess. Like a billion kids (and adults!) before me, I am a fan of Potatoes in any shape or form. Variations of a dish is simply an excuse for trying it again and again. I know I already posted something similar when I was just a baby in blogging years. But like I said, its an excuse for loving something so much. And anyways, I know scores of families who would do the same potato dish week after week to no complaints which reminds of this college pal of mine whose mother gave her a potato dish every other day for lunch box. Every. Other. Day! And yes, I was actually jealous! 1. 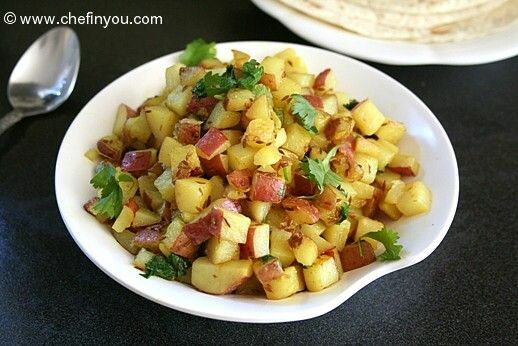 Potatoes: You can use any Potato for this dish. 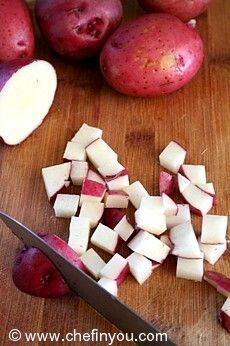 For today's post I used the red variety - I might want to sound like a pretentious know all and say "for color and texture and best suited for roasting " or accept that its the type I had on hand on this particular day ;) But I do think New Potatoes would be best for this dish. 2. 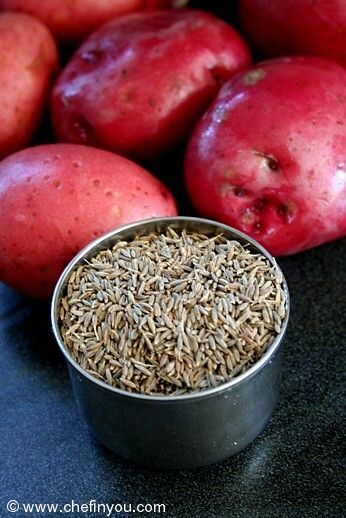 Cumin: You can also try this dish with Caraway seeds instead of Cumin. 4. Lemon Juice: If you cook Indian food more often, then most probably your pantry would carry a spice called "Amchoor"/ "Dry Mango Powder" made from dried green mangoes. It adds a nice tang to the dishes. Add 1/2 tsp of mango powder if you have it. But if you don't or like me are partial to fresh lemon juice ( too many lemons in the backyard), then simply add it as per your liking. 1. 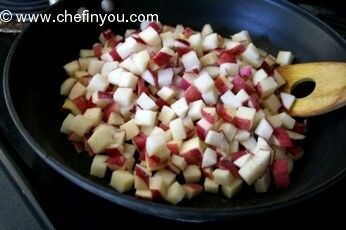 Chop the potatoes into sizable cubes. 2. Heat a skillet on medium along with 1 tbsp Ghee/ Butter. 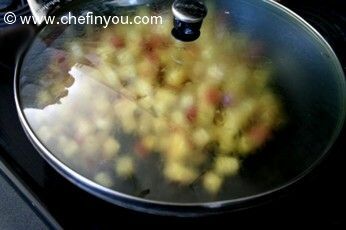 OK, spoil the fun and insist on 2 tsp oil!. 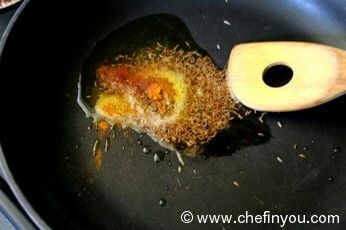 Add the cumin, turmeric and chilli powder and let the cumin sizzle. 3. 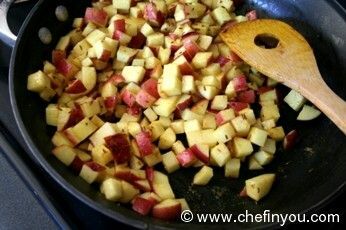 Before it threatens to burn on you, add the potatoes along with salt. 6. It takes around 10-12 minutes max (If you own a good gas burner or shucks, even a decent electric stove, it might take you less than what it takes me!) If the potatoes are soft when you press them with your fingers , its done. 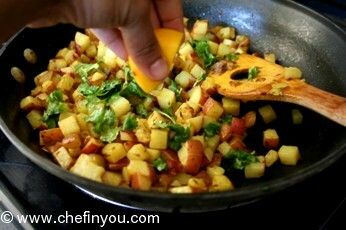 Garnish with lemon juice and cilantro. Toss slightly to combine. Serve hot with steamed rice, pulavs or rotis. Hi, do you get these red skinned potatoes in Bangalore? i haven't seen it here anywhere! 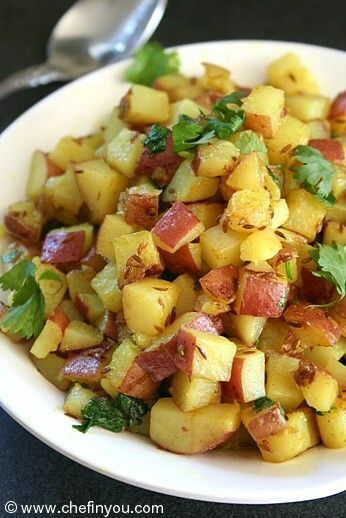 These potatoes look so good, I can gobble up the whole lot. Will definitely make some of this soon. Do you have a recipe for Indian spice tea?